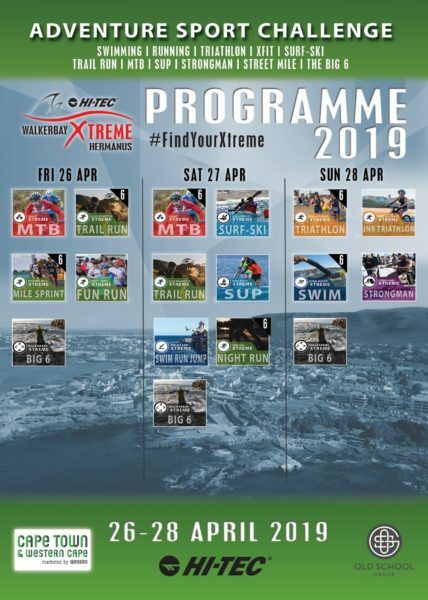 A 2-day MTB stage race, 2-day trail running stage race and a night run have been added to the event mix offered by the HI-TEC Walkerbay Xtreme (WBX), a multi-day adventure sports festival returning to Hermanus for a fourth time from 26 to 28 April 2019. “We are constantly looking for ways to make this event even more exciting and inclusive. Hermanus is a hotspot for adventure sports and we invite all sport lovers, no matter what their ability, to study the events line-up and choose two or even three events to challenge themselves,” says Gerhardi Odendaal, CEO of Old School Group (OSG). OSG co-own and run the event in close association and partnership with Hermanus and its people. The Hi-Tec Walkerbay Xtreme is also backed by sponsor Hi-Tec, the Hermanus Business Chamber and Hermanus Tourism. The three new items offer participants an even greater selection. “Stage races as well as night runs are becoming increasingly popular and we wanted to incorporate them into our event because we know that there is a market for it. Along with the triathlon, the MTB races and trail runs are key events for us and we want to offer our athletes who thrive in these disciplines the opportunity to challenge themselves even further,” adds Odendaal. The Valley Xtreme MTB (MTB stage race) takes place on 26 and 27 April and participants will ride approximately 60 km per day over the two days. The routes will take them to the beautiful Hemel-en-Aarde Valley where participants in the ABSA Cape Epic competed only a few weeks ago. The Blue Mountain Xtreme (trail run) will also be held on 26 and 27 April, and includes stages of 19,1 km and 21 km. Both items offer scenic routes and amazing views over mountain and sea. Sport lovers who do not want to take part in a stage race, can choose between three distances (20 km, 35 km and 60 km) in the MTB race or two distances (21 km and 9 km) in the trail run on the Saturday. The third new item on the menu is the Twilight Xtreme (night race) – a 7,1 km run on Hermanus’s famous Cliff Path on 27 April. The first 50 entrants will receive LED Lenser head torches with their entry. With 14 events to choose from, the Hi-Tec Walkerbay Xtreme offers something for everyone – from adventure seekers, professional athletes and fitness fanatics to recreational outdoor enthusiasts looking for a new challenge and a fun-filled sporting holiday in one of SA’s favourite adventure sport hotspots. All the old favourites are back too – the Big 6 Xtreme, sprint triathlon, MTB criterium, open water swim, cliff path runs and street mile – as well as the exciting swim-run-jump challenge, guaranteed to get the adrenalin pumping. The 2019 Hi-Tec Walkerbay Xtreme offers prize money in excess of R100 000 split across a number of events. The Big 6 Xtreme will be held over the course of three days and participants will share a R30 000 prize purse. “The Hi-Tec Walkerbay Xtreme is multi-faceted, bringing in elements of family bonding, friendly competition, outdoor activity, and a sense of unity, all in what I consider to be one of the most beautiful towns in South Africa,” says Dan Gluckman, sports coordinator at Old School Group. For more information, follow Hi-Tec Walkerbay Xtreme on Facebook (www.facebook.com/walkerbayxtreme), Twitter (@walkerbayxtreme) or Instagram (@walkerbayxtreme).